It’s a welcome to the92.net blog to budding journalist and Yeovil Town fan Alex Burnell. 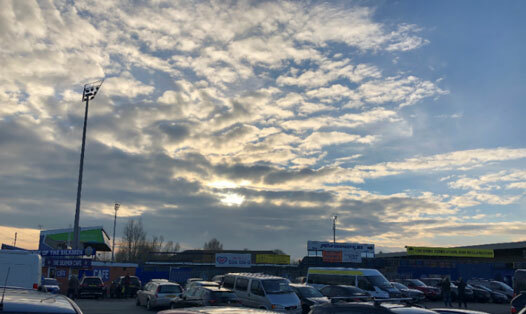 Alex shares his thoughts on a trip to Moss Rose, the home of Macclesfield Town, as the Glovers’ were in town. It’s been a while since Macclesfield Town and Yeovil Town have played each other, an eventful 13 years for both concerned. But Saturday 24th November saw the two face off in what could hardly be described as a classic. Now we had it fairly easy, being a lifelong Yeovil fan who is currently studying at a university in the East Midlands; it was one fixture I was particularly drawn to when scanning the football calendar, especially seeing as I had yet to visit Moss Rose. After a 50-minute journey to Stoke-on-Trent, we promptly changed trains and headed north for a further 20 minutes towards Macclesfield. I did spare a thought for the travelling Yeovil faithful enduring the four-hour trip along the old nemesis of the M5. The Silkmen Cafe & Away ticket office. We were particularly drawn to the mosaic murals around the outside walls celebrating the football club, as well as the town’s silk industry background. This was was a unique feature I had not seen elsewhere and added character to an already eccentric ground. We were greeted at the away turnstile by two friendly stewards (although the supervisor operating in the away end seemed to get far more involved with the travelling contigent than perhaps merited.) We were told that the away terrace would not be open, I personally love to stand behind the goal at away games so was naturally a bit gutted by this. Away supporters were instead housed in the Big Brand Ideas Stand with the 218 Glovers very vocal throughout the game. The match was by no means an advert for League Two football, with both teams lacking real quality in the final third. The Silkmen edged the first half and came closest to breaking the deadlock despite Yeovil having two goals ruled out for various wrongdoings. Danny Whitaker’s deflected header required an excellent reaction save from Stuart Nelson in the Yeovil goal, with Tom James having the best chance for the away side with a 35-yard freekick being tipped over the bar as the stalemate continued into half time. After the break, Macclesfield ‘keeper Kieran O’Hara had to be alert to push a back-pass from his own defender James Pearson clear of danger. However, it was the home side who managed to score the only goal of the game. Elliott Durrell was bundled to the ground by Yeovil’s Tom James inside the box, resulting in a penalty that ex-Glover Michael Rose duly dispatched. 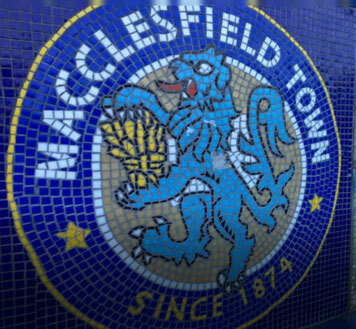 Despite going behind, Yeovil failed to fashion any real chances before the end, and it was Macclesfield leaving as the happier set of fans with a 1-0 victory. All-in-all, a very disappointing day as far as football was concerned. However, Moss Rose was an interesting ground to visit with a few noteworthy and distinctive features. It was a welcome change to the ‘usual type’ of stadium seen in League Two. I hope for this sake, Sol Campbell can lead Macclesfield to Football League survival, as it is a stadium which I would like to visit again in the near future! Atmosphere 1/5: Very limited atmosphere from the home faithful, even after the goal went in. The Yeovil fans were in good voice and made their feelings heard. Location 3.5/5: A 25-minute walk from Macclesfield Station which seemed easy enough, particularly as it appeared to be in one direction. Value for money 2.5/5: £12 for under-25s seemed fair enough, but £22 for adults was perhaps a bit extortionate given the circumstances. Pint/Pie/Programme: I unfortunately did not get to sample any of these, although the catering staff were very friendly when we purchased some snacks. I did not see anywhere to buy a programme. Character 4/5: As aforementioned, Moss Rose definitely had a bit of personality which was great to see. It maybe could do with some minor modernisation as some areas seemed a bit neglected. Stewarding 3.5/5: Although they seemed friendly and approachable as a whole, there were a few who seemed bizarrely intent of causing a scene. Thanks for Alex for taking the time to share his thoughts on Moss Rose. You can keep up with Alex by following @Alex_Burnell on Twitter.